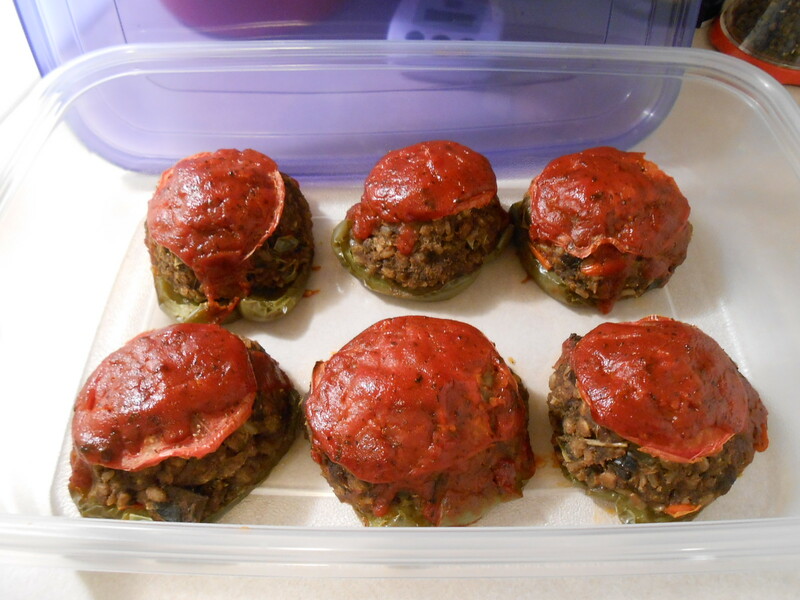 Sauteed eggplant, onion and peppers mixed with a multi grain and legume mix. 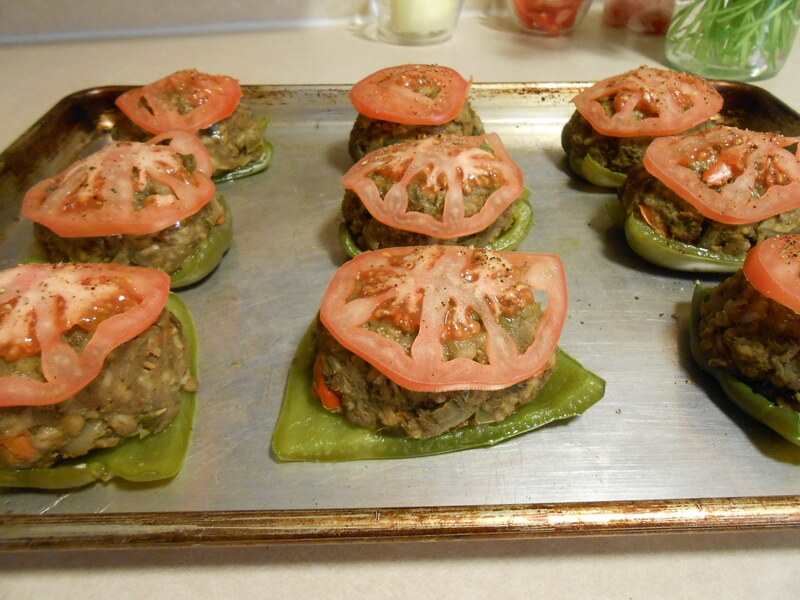 Stuffed into pepper shells, topped with fresh tomato slices and a Lemon Mint Tomato Sauce! Fit for royalty! Core peppers from the top. Cut each pepper from top to bottom into 3 equal segments – makes total of 9 shells. Bring a pot of lightly salted water to boil. Add peppers, partially cover, and cook till tender, but not mush. It won’t take long. Remove peppers immediately, rinse under cold water, then drain on plate. Set aside. Rinse and drain peas and lentils till all foam disappears. 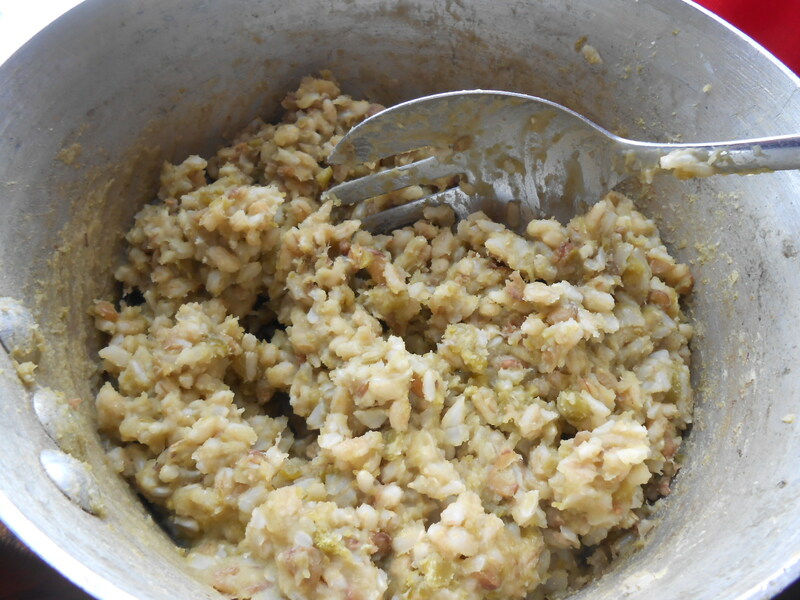 Place peas, lentils, barley, brown rice and water in large saucepan. Stir well, bring to boil, stir well again. Cover tightly, reduce heat to low and cook a total of 1 hour, removing lid to stir well every 20 minutes. Set your timer for 20 minutes so you don’t forget, then another 20 and another 20. Remove from heat. Sprinkle salt over mixture, then stir and stir to evenly distribute. Transfer to bowl and set aside. Notes: Stirring at intervals is necessary when cooking small amounts of grains and legumes, since the lentils rise to the top and need to be stirred back in. This is an important step in order to cook all ingredients evenly. In extra-large skillet, over medium heat, melt margarine with oil. Add all veggies at once. Stir to coat with oils. Saute till wilted, stirring often. Reduce heat to medium-low when it starts sticking to skillet. Add salt through sugar. Stir very well to evenly distribute. Continue to cook on medium-low heat till veggies become soft and onion translucent. Cook about 15 minutes or till eggplant becomes mush and there’s no liquid in the pan. We want the mix as dry as possible. Now add grain/legume mix to veggies. Stir well to incorporate, then cook another 10 minutes to evaporate more liquid, drying the mix even more. Salt to taste, then cool to room temperature. Refrigerate, covered, till ready to use. Combine all ingredients in small saucepan, over medium-low heat. Cook, stirring often, till margarine melts. Continue to cook about 10 minutes, stirring occasionally. Turn heat off. Adjust for salt, then set aside. Place pepper shells on large baking sheet. Divide the stuffing into 9 equal scoops, forming and rolling each in your hands like a meatball. Place on individual pepper shells, pressing it firmly onto the pepper, while maintaining a smooth round/oval shape. 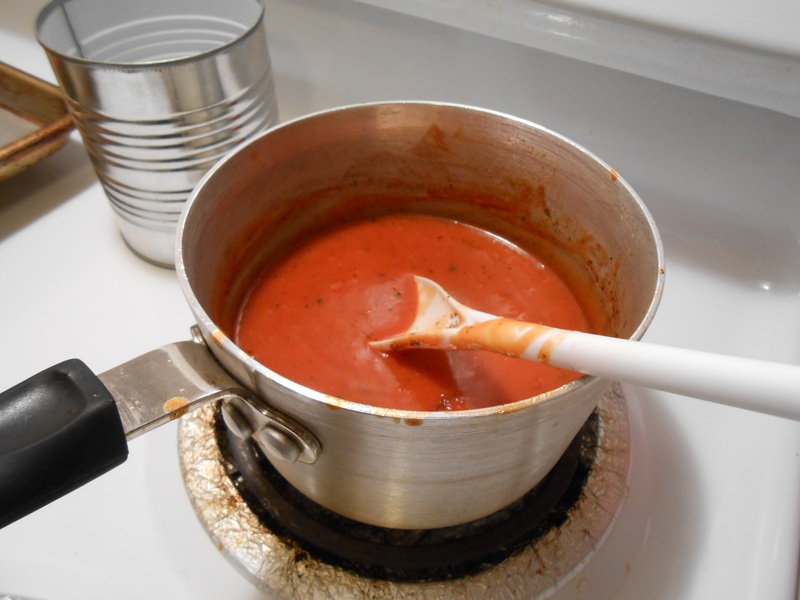 Top each tomato with a couple of tablespoons of sauce. Bake on middle rack of preheated 350 degree oven for 40 minutes. Remove from oven and serve. Notes: If you don’t want to work so long on the day you serve these peppers, then make the stuffing the day before and refrigerate, covered, till you’re ready to stuff peppers. 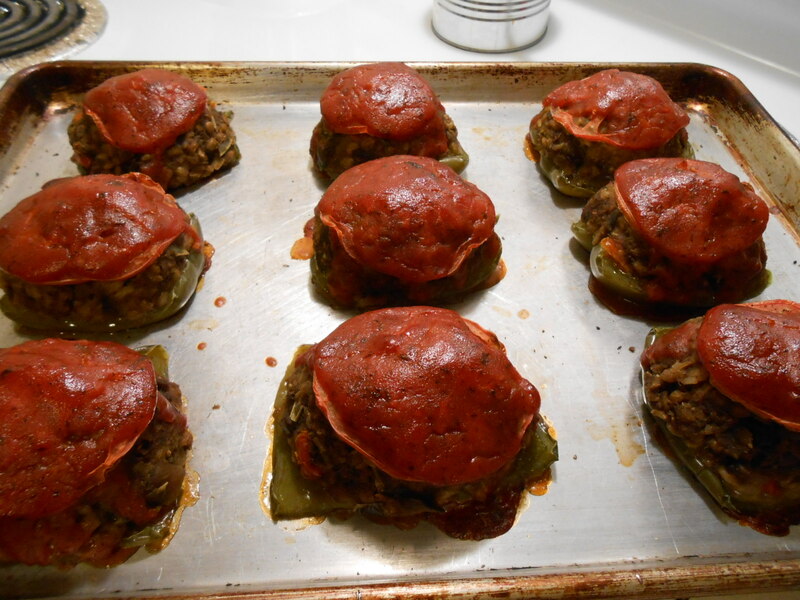 Most people when making stuffed peppers stuff the whole pepper. I recall from childhood my mother doing the same. But when we kids were finished eating and asked to be excused from the table, what was always left on the plate were the empty peppers. We liked the filling, but the pepper by itself wasn’t appetizing. 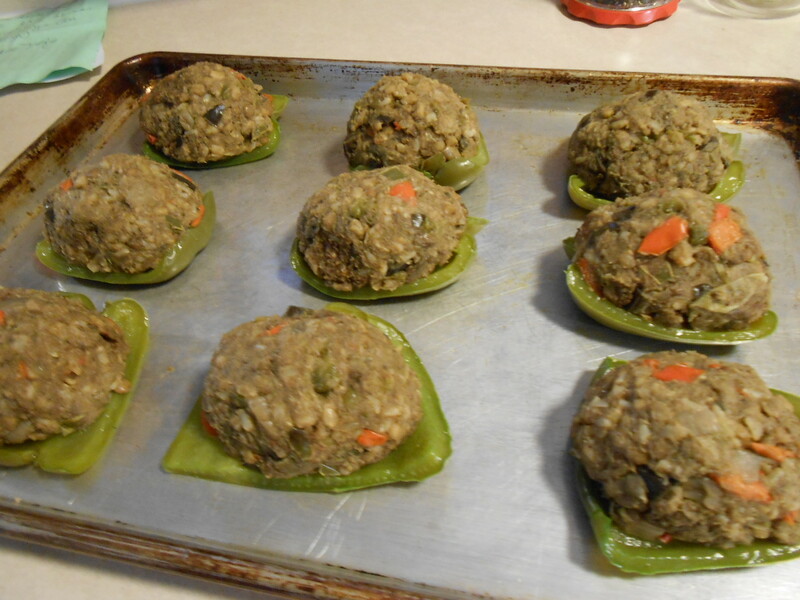 I now make pepper shells, so the stuffing can be easily eaten along with the pepper, and the pepper doesn’t overwhelm (due to size) the entire dish. These peppers travel well to a pot luck gathering – as long as you keep them flat. Place in covered plastic container in one layer. When you arrive, place on baking sheet and reheat in oven.